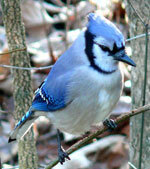 A Blue Jay. Wikimedia Commons photo. Name (Common) Name (Scientific) Photo Distinguish from Bluebird Location in U.S.
Last updated May 16, 2016. Design by Chimalis.